We’re number 1! The Washington Post says the Pennsylvania is the most likely state in the country to see a party switch in the Governor’s office. The Fix cites Gov. 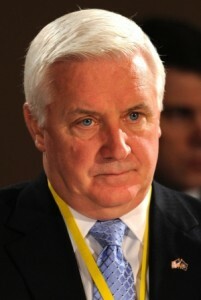 Tom Corbett’s string of bad polling as the reason he moves to the top of the list for the first time in the 2014 cycle. It’s been a steady climb. WaPo rated him number 3 in June and number 5 in July. Corbett came in with lots of corporate money.He has consistently governed for his corporate sponsors interest. His agenda against the middle class is so bad that he can’t get the Republican dominated House or Senate to work with him. He is toxic for their election campaigns in 2014 also. Throw in his problems with NITTANY NATION and he is a one term Governor. Can anybody say Governor Rob McCord? If it Look like a duck, smells like a duck, quacks like a duck, it must be a lame duck. Perhaps if the Democrats put up a credible candidate, this would be true. But, Schwartz is a wacko. She is basically Nancy Pelosi. Once she opens her shrill, liberal mouth, she will be done. She may have done well in SEPA, but what will voters state-wide think of every comment out of her mouth being about gay marriage, restricting guns, global warming, and her love for obamacare? This psycho shouldn’t be allowed to run a car wash, let alone a state. Corbett is a prosecutor and nothing else. He should never have been elected in the first place. He owes his office to the elitist RINOs that are running Harrisburg, the same RINOs who refuse to listen to the wants and needs of the electorate of Pennsylvania. Corbett Team: Should have listened to my idea to pardon Mumia and then use the RGA and other special interest money to buy him the DEM nomination. Surely the PAGOP can beat a dangerous black socialist with a funny name-OOPS! Maybe this idea won’t work either. Time to talk about Vaginal scans again. Tom Corporate has sold the state of Pa to the highest bidder. While serving in the military ,I believed that America , even with some flaws, was still the best hope for humanity by having a democracy. Now that international corporations can buy the USA, it is being conquered without bullets, but dollars. Our Constitution warned us and gives a solution to tyranny. Taxation without representation means the people, not foreign lobbyist.. WE THE PEOPLE, has to be restored at all costs. We are more powerful than we think. Quit buying foreign products and insist from merchants to do the same. Money talks. Don’t wait for somebody to do something . You are somebody.